We specialize in going the distance. We are your transportation service experts. Connors Transfer has offered a complete range of transportation services for over 35 years. We specialize in time-sensitive delivery of both dry and temperature controlled products. Using strategically positioned terminals, we efficiently move both full loads and less than truckload freight throughout North America. We embrace the latest technologies and operate new model equipment to ensure our customer’s freight is delivered on schedule. Connors Transfer is a family owned and operated trucking company headquartered in Stellarton, Nova Scotia. Over 400 new model trucks, single and duel temperature 53 foot reefers, and dry vans. Serving North America through strategically positioned terminals in Nova Scotia, PEI, New Brunswick, Quebec and Ontario. Full load and LTL transportation of dry and temperature controlled products. "Connors is a great place to work. There is a good variety of work, good pay, and a pension." 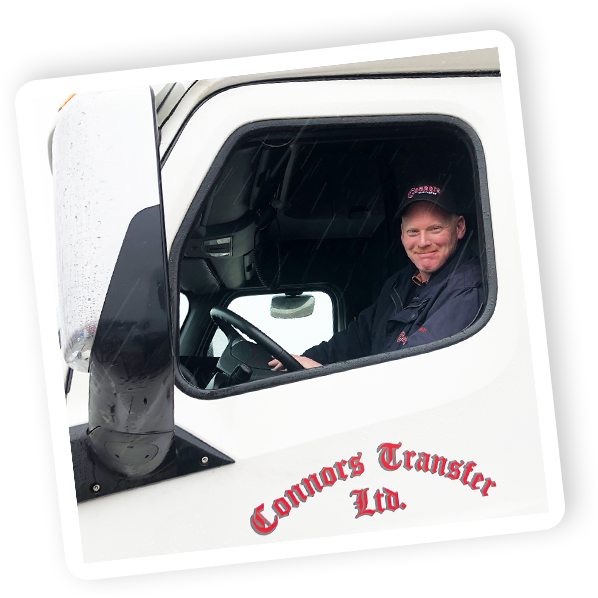 At Connors Transfer, drivers are respected and valued members of our team. We are proud to be one of the leaders in our industry for driver compensation, have a company funded pension program, new model equipment, and professional standards while still maintaining a family-like environment.